Do you buy your meat directly from farmers? 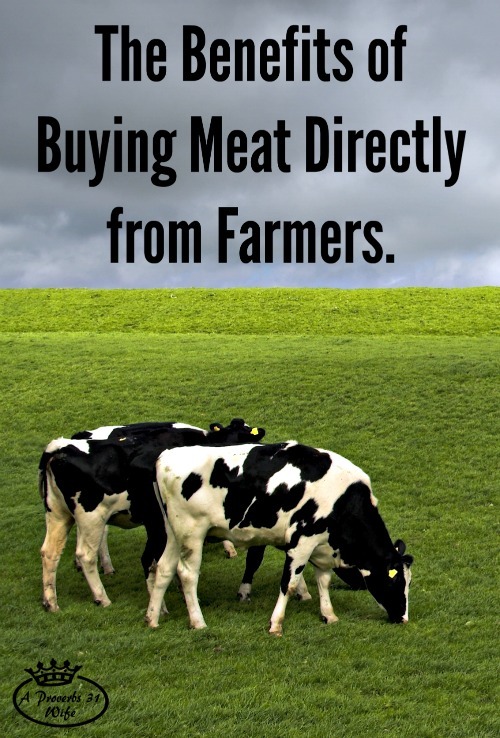 Do you know what the benefits of buying meat from farmers are? Since I grew up on a farm, we had access to beef and chickens. In the wintertime we would get a hog from a farmer and butcher it ourselves. My parents no longer raise cattle, but they still have chickens and we (Jason and I) still get our chickens from them. However we were spoiled by getting meat straight from the farm, and to us the store-bought meat just didn’t taste very good. So we started looking around and my family began buying and splitting a beef each year. We still do the same with pork. So, what are the benefits of buying meat from farmers? #1 You can see where your meat comes from. Most farmers allow you to visit the farm and see how the animals were raised. You should also use this time to learn what the animals were fed. #2 You have the choice to butcher and/or cut up and package your meat. If you don’t want to get your hands dirty, you at least get to choose who processes your meat. #3 You have control over what goes into your meat. For instance, we like our sausage seasoned. Mother mixes up both Italian and breakfast seasoning and gives the mix to the butcher shop. #4 The savings. Even if you are paying someone to butcher and package your meat, you still save. After I paid the farmer and the butcher for the last beef we got, I weighed out all the packages and learned that we paid about $6.50 a pound for our processed meat. We butcher and package our own pork. Last time we did this, we purchased organically raised hogs and Jason and I put 1/2 a hog in our freezer for well under $200. This will last us all year. #5 You are supporting your local community. Need I say more? It’s the little guys who hurt the most in recessions, and it’s actually the little guys who make the community worthwhile. Mother has found farmers on Craigslist in the past and been very pleased with her findings. I’ve recently came across another site that is wonderful for finding farmers locally. That site would be LocalHarvest.org. Do you believe in the benefits of buying meat from farmers? Have you ever butchered and cut up your own meat? We have done beef, poultry, pork and venison in the past. Hi there. Thanks so much for this post. We are a small farm in upstate NY. We sell for less than what you paid and will have trouble finding buyers sometimes. I changed my diet -a complete turnaround – about 6 months ago and have been looking for grass-fed beef and free-range chickens & their eggs. Living in south Arkansas, it has been hard to find. So I searched online and that is where I found grass-fed & grass-finished beef (meaning the cattle is never given grain and the grass is usually different per area of where the cattle eat – thankfully I don’t have to buy a minimum of 1/4th of the cow) As for free-range chickens – that is even harder to find as they are all given grain (unfortunately that grain contains corn & soy and often is Genectically Modified – or GMO). I am currently eggs that are considered Natural and are not given soy – but the grain does have non-GMO corn – which is the best so far. — So I a thrilled to hear of those who farm or live close enough to family/friends where they can get the better meats & eggs.